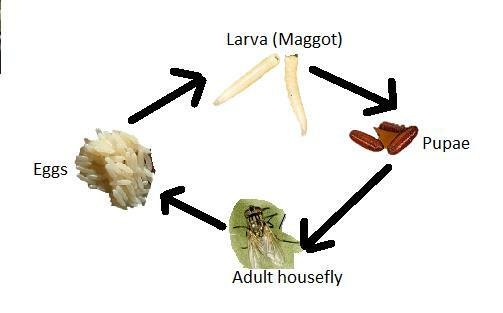 Female flies deposit their eggs on decayed, fermenting or rotting organic material of either animal or vegetable origin. Heaps of accumulated animal faeces are among the most important breeding sites for houseflies. The suitability of dung for breeding depends on its moisture (not too wet), texture (not too solid) and freshness (normally within a week after deposition). Garbage provides the main medium for breeding. It includes waste associated with the preparation, cooking and serving of food at home and in public places, and with the handling, storage and sale of food, including fruits and vegetables, in markets. Fields that are heavily manured with organic matter such as dung, excrement, garbage and fish-meal may provide suitable breeding places for flies. Houseflies also breed in sewage sludge and solid organic waste in open drains, cesspools (underground pools for household sewage) and cesspits. Piles of decaying grass clippings, compost heaps and other accumulations of rotting vegetable matter serve as good breeding places for flies. Eggs are laid on organic material such as manure and garbage. Eggs are usually laid in clusters of 120 – 130. These are pearly white in colour. These hatch into larvae. The larvae are slender, white, legless maggots that develop rapidly. They then form Pupa which looks like a maroon coloured capsule. The transformation into adult takes place inside the pupa. Soon after emergence the fly spreads its wings and the body dries and hardens. The adult fly is grey, 6–9mm long and has four dark stripes running lengthwise on the back.